Harrison is the result from an outstanding cross deeply root 9 times to the great foundations sire Ramzes through Ramiro and Capitol. With this cross we wanted to keep the elastic gaits of her dam to produce a jumper with good movement and outstanding jumping quality. He is strong, well built with tall legs and a particularly amenable disposition. He will be presented to his foal keuring where we expect a First Premium. We are quite please with the result. Sire Contendro I has it all: beauty, athleticism, suppleness, movement, talent and a wonderful character that he transmit to his gets. He is one of the best son of his famous sire Contender. His success as a stud is undeniable. He was licensed for Hanover,Holstein, Oldenburg, OS, Westphalia, Rhineland, Mecklenburg, all Southern Verbands, France, Italy, Netherlands, Switzerland and Hungary. So far he has more than 56 licensed sons. ! Contendro I started as a premium stallion at his approval and won his stallion performance test with the best jumping score of 147.29. He also received high score in the dressage index ending on fourth place among the 39 stallions tested with a score of 131.09. 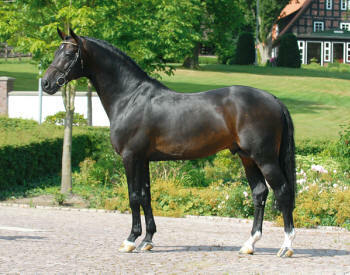 In 2001 he placed with the best at the Holstein Riding Horse Championships and was nominated for the Bundeschampionat. Contendro I was recognized right from the start as an important sire and his breeding duty gave him little chance to develop himself as an international jumper. Nonetheless he always placed himself in all of his occasional journey in the jumping ring. Contendro has produced more than 26 jumpers at the highest level of sport ( 1.50 -1.60m ) which is more than 6 times what the average stallion produces. This is without multiple competitors at 1.40 m and ZZ level jumpers and more. We can consider Contendro I as one of the best sire available . His dam Bravo was an outstanding broodmare. This mareline include 15 approved stallions and Bravo had four approved stallions; Contendro I and II , Caretano approved stallion, Holst., Z, Rheinl, and SI who died at to much of a young age after being World Champion of the 7 year old and Cassito also Holsteiner appproved. 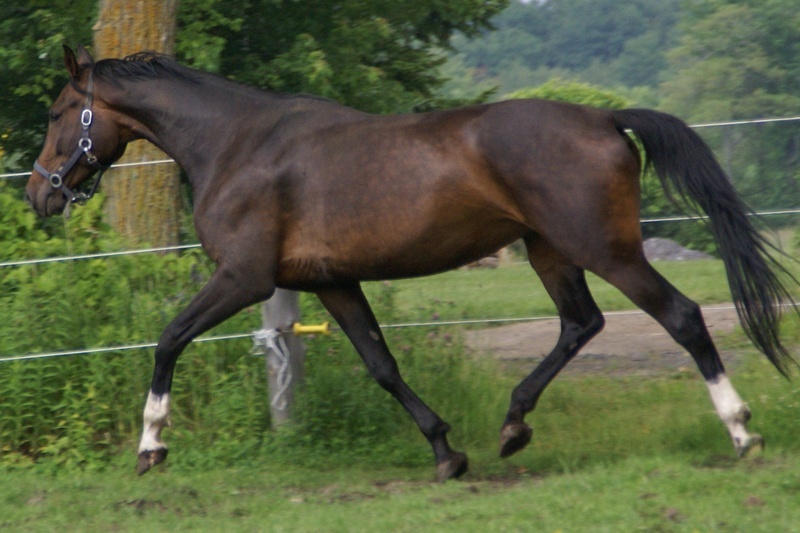 Bravo also produced BB Caretana, an international jumper winner in the 1.50m. and Cassello 1.60 m jumper ranked 763e in the WBFSH 2010. What a great dam. His sire is the world famous Contender, proving to be one of the most influential sons of Calypso II. Contender was with Cassini and Caretino the most sought after stallions in Germany . He won just like his son, his stallion performance test . Anime impressed everyone by her commanding presence and yet her kind attitude. She is the favorite of the crowd. His trainer had mentioned that he would love to have a stable full of this kind of horses. 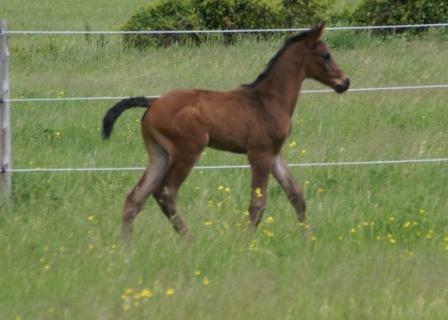 We bought her as a weanling and was presented as a yearling to the Pine Land Keuring where she was First Premium and Best Young Horse. She ended up First in the top ten yearling of the KWPN North American tour when the dressage and jumpers where in the same class. Her sire Indoctro is one of the most successful jumping sires in the world and was declared Preferent at the young age of 16. He is the sire of more than 52 licensed sons and in 2009 he was the sire of the Champion and Reserve Champion of the KWPN approval. In the 2008 Olympics there were 3 of his offspring selected. All over the world Indoctro has produced winners at Grand Prix and World Cup level. Casadora, Youp, Tampa, Nassau, Black Ice, Orame, Picolien, Zeldenrust and Robin to name a few. His most famous offspring include Nike, VDL Masserati, Nadia and Nobel. Indoctro not only passes his jumping genes but also a good conformation which is demonstrated in many champions at the several mares and foals show. Anime is a good example. His dam Vanessa VII also produced two full brothers, C-Indoctro II and the Olympic showjumper, National Guard ridden by Fahad Al Geaid. Dam of Anime P, Pepita S is by the famous KEUR stallion Emilion. Emilion had a great carreer as a Grand Prix show jumper where he won the World Cup at Mill STreet, 4th at Valkenswaard, 2nd in Donaueschingen, 5th in London and 6th in the World Cup at Aarhus. With the German Team, he was 4th in Dublin and Rotterdam and 2nd in Bremen. His ‘Keur’ IBOP dam is a daughter of the full sister of the Holstein top sire ‘Lord’.